It’s no secret that central bankers have flooded the world with cheap credit which has flowed into every asset known to man. The result was a massive inflation in asset prices, with the hope that real inflation would be close behind. When one looks at the commodity sector today, you wonder how any of these Central Bankers has a shred of credibility left. As the US economy runs headfirst into this immovable wall of deflation, economists and central bankers will watch helplessly as one by one sectors of the American economy fall like dominoes. First there was oil. The US oil sector took a big hit. No big deal, the US is a net importer, we’ll benefit from the wealth transfer. But US oil sector was very capital intensive. They didn’t realize that they require lots of steel for pipes and drill bits and such. 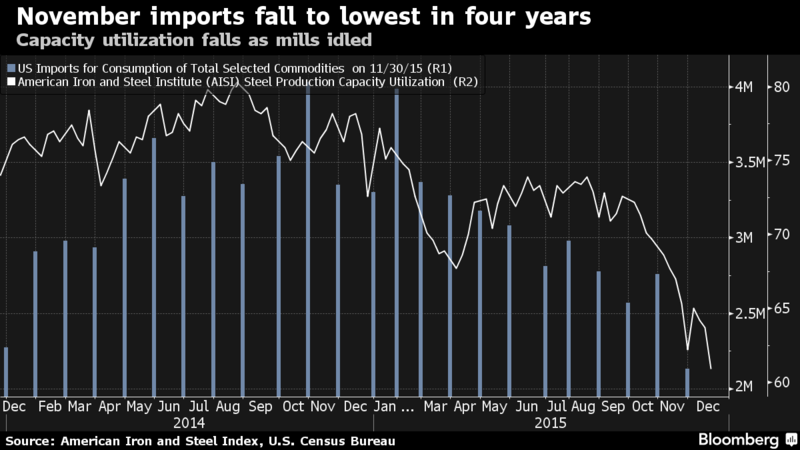 So the US steel sector took a hit. No big deal, we don’t really manufacture much anymore and we still import steel. How do we transport oil in this country? By rail. 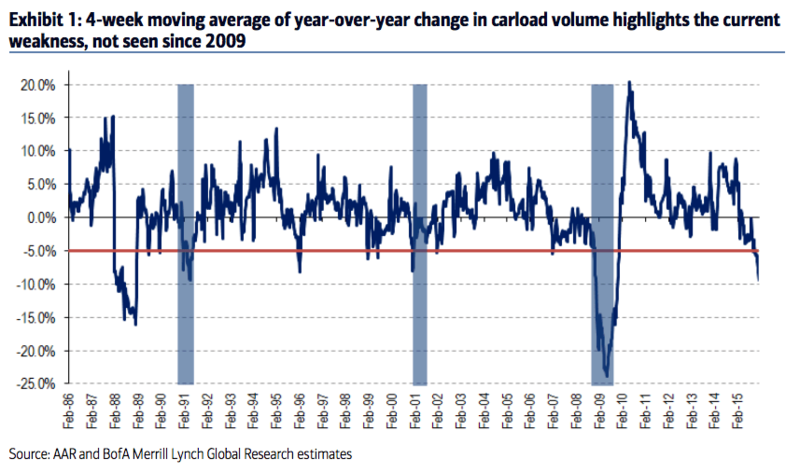 How’s rail traffic going? It’s plummeted. Oh crap. What about agriculture? The US is still the bread basket of the world. That has to be going well right? The Fed’s zero interest rate policies incentivized people to acquire debt to bid up the price of farmland. 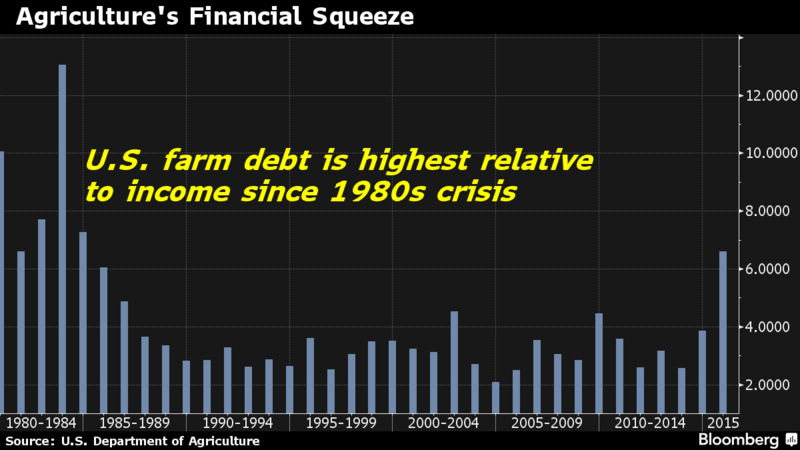 And now look, prices for farmland is at all time highs, but profits have fallen to a 13 year low with debt levels not seen in over 3 decades! The sad thing is that the story of US agriculture and US shale are not unique. This story of cheap debt leading to short term asset and commodity inflation inevitably ends in a deflationary trap where these heavily indebted companies are forced to produce as much as possible in order to stave off bankruptcy. The American economy is starting to feel the strain. Growth is slipping. Inflation is non-existent. 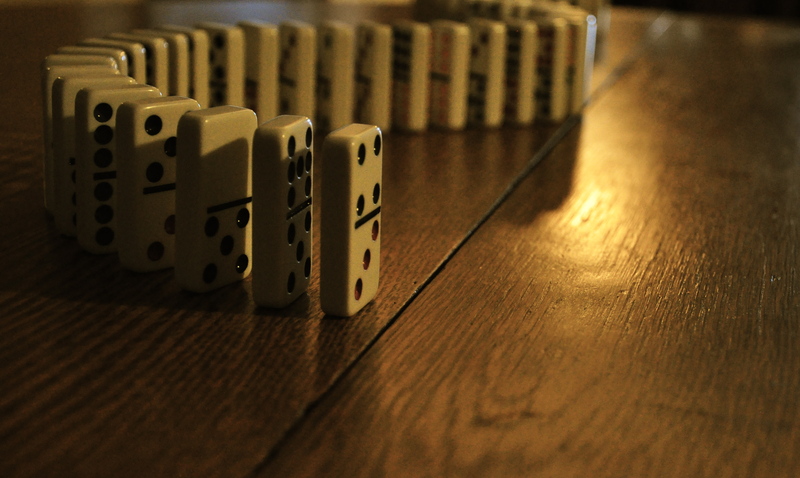 At this point, everyone is just waiting for the next domino to fall. Will the auto sector be next or perhaps consumer spending? Either way, one thing is sure, enough dominoes have fallen that the momentum has been established. It’s only a matter of time before the rest of America takes a hit.